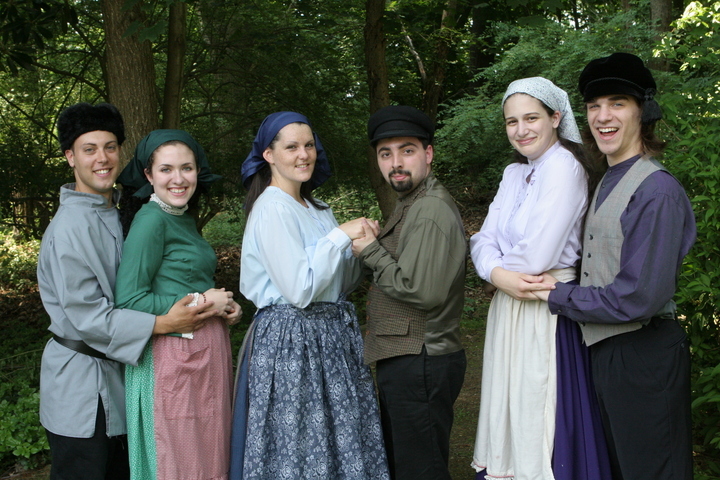 If all of the productions at Musicals at Richter, Danbury's outdoor theater, are as well staged as the season opener, "Fiddler on the Roof," you need look no further for summer entertainment for the whole family. Director Donald E. Birely has assembled an enormous cast and put them through their paces like a master. He earns much of the standing ovation the show receives at the end. Winner of the 1965 Tony Award for Best Musical, "Fiddler" has always defied the logic that spawns musicals: Who would want to see a show about Tevye, a lowly Jewish milkman in pre-Revolutionary Russia who talks to God like a next door neighbor? 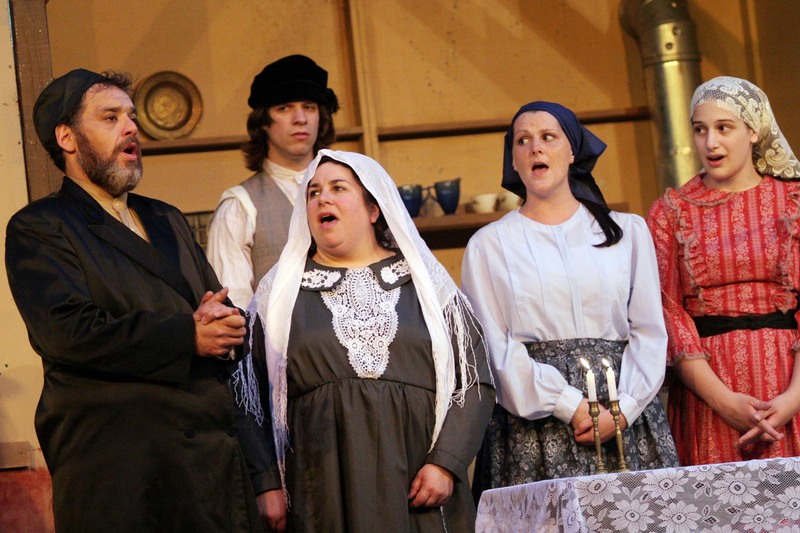 Well, as it turns out, the human elements in Tevye's story touch the hearts of everyone and provide insight into Jewish family life with song, laughter and a touch of genuine sentiment. The solid book by Joseph Stein has held up well because Tevye's story is a timeless one of parents and children and the humor springs from real life experience. 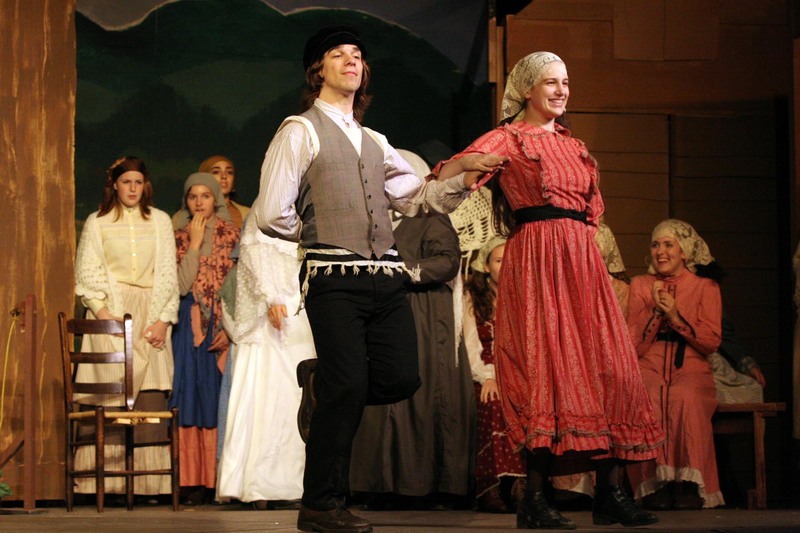 Couples will readily identify with the loving sparring between Tevye and his wife; young people will identify with the longing of their children. The score with music by Jerry Bock and lyrics by Sheldon Harnick is a joy, Jewish without sounding ethnic and exuberant throughout. What show wouldn't like to include in its score: "Sunrise, Sunset,""Tradition,""If I Were a Rich Man" and "Matchmaker"? It's 1905 in Anatevka, where Tevye and his family live, a little village which could be the Grovers Corners of "Our Town" transported to Russia. Tevye has problems about which he constantly complains to God. His wife Golde is constantly on his case, his horse is lame and he has five daughters each in need of a husband. In addition, the Russian revolution is heating up in the distance. This show, despite its appealing story and warm characters, does not work without an actor that fits the role of Tevye like a glove. There have been a couple of recent revivals with unusual casting "" Alfred Molina and Harvey Fierstein "" but they worked mostly because the show was beautifully staged and hadn't been seen on Broadway in quite a spell. Richter has a winner in Stephen DiRocco. The actor has a strong sure voice, a booming delivery and a good sense of comedy. In addition, he looks like a Tevye should look "" OK, he's probably padded! 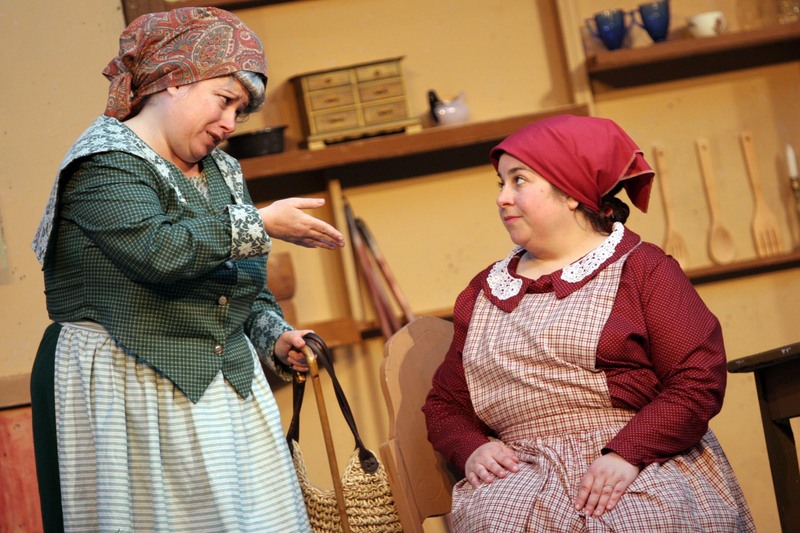 Barbara Kessler is an excellent no-nonsense Golde and Cat Heidel chews the scenery effectively and amusingly as Yente, the village matchmaker. 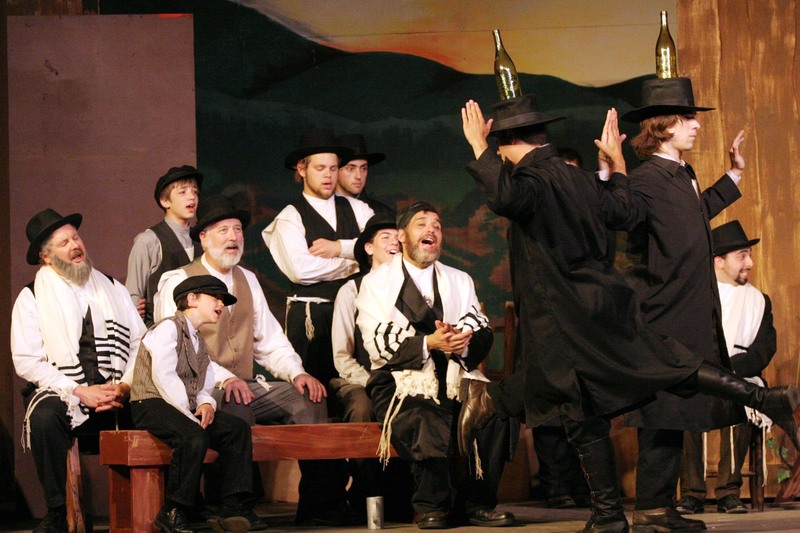 Among the townspeople Eric Greenfeld as Lazar Wolf, the butcher and Mike Lozier as the Rabbi offer amusing portrayals. Center to the story are the five daughters and the budding romances of the three eldest, Tzeitel (Cesira Farrell), Hodel (Allegra DeVita) and Chava (Caitlin Keeler). None of their beloveds are in keeping with the Jewish traditions of the village. Tzietel is in love with the ambitious but poor tailor Motel (Matt Austin), Hodel falls for the radical teacher Perchik (Robert Sniffin) and Chava breaks all the rules with her love for the Russian solder, Fyedka (Matthew Farina). All six young performers create strikingly individual personalities and there isn't a weak voice among them. Austin shines in the spirited "Miracle of Miracles" and Sniffin and DeVita handle the show's lone love ballad, "Now I Have Everything" with feeling, as they say. Lone love song that is, unless you include the query Tevye poses to Golde: "Do You Love Me?" Every couple with 25 years of married life or more will understand in a flash the unanswerable humor of that question. It's a very large cast and there were no incidents of people tripping over one another. In fact the actors looked well rehearsed and confident. Birely and Christopher Gladysz get an A+ for their choreography but only a C for their scenery. Most of the buildings in the set look unfinished and plain. One nice, ironic touch "" a panorama at the rear of the stage initially looks like something left over from "Oklahoma!" As the sun began to set, however, the colors took on the look of a painting by Marc Chagall "" a Russian Jew whose work adorns the walls of the Metropolitan Opera House in New York City. Nice touch, guys. The musical accompaniment, once a weak spot at Richter, is now up to speed. Under the baton of musical director Stephanie Gaumer-Klein, the six piece orchestra delivered a rich, tempo-right backup for the singers. You can't go wrong with this "Fiddler," and the added charm of picnicking on the grounds before the show and watching the stars sparkle above make this a perfect summer excursion for the family. A final word of praise for expert fiddler Julien Heller perched on high. His music was sweet and sad, just as you might expect. 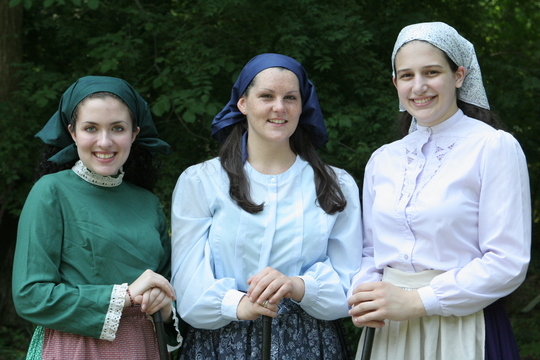 "Fiddler on the Roof" plays through July 7 at Musicals at Richter, Richter Arts Center, 100 Aunt Hack Road, next to the Richter Golf Course, Danbury. 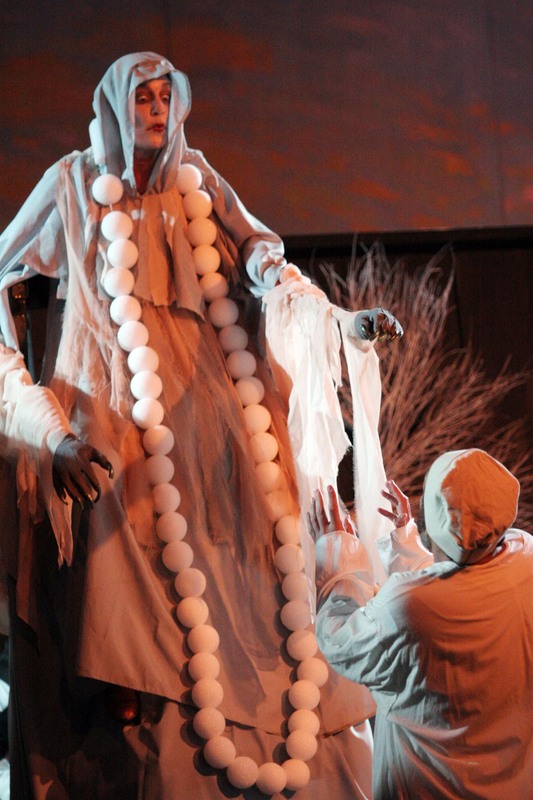 Performances are Thursdays through Sundays at 8:30 p.m. The grounds of the art center open at 7:15 for picnicking. Tickets are $20; $15 for seniors and $12 for students and children. Group rates are available. Lawn chairs may be rented with advance reservations and there is a concession stand on site. For more information, directions or reservations, call (203) 748-6873 or visit the Web site at www.musicalsatrichter.org. Attempting to live a normal life filled with Jewish traditions in early twentieth century Russia, Tevye, a dairyman, is searching for appropriate husbands for his three eldest daughters - Tzeitel, Hodel and Chava. In a break of tradition, his daughters refuse to accept the wishes of the matchmaker, Yente, and their father. Instead, they marry men that they love. Meanwhile, Russians are instigating terrible pogroms against the Jewish people in Russia. In the end, the Jews of Anatevka are forced to leave their homes and Tevye is determined to start a better life in a new land. Fiddler on the Roof is regarded as one of the most famous stage and film musicals. It opened on Broadway on September 22, 1964 with music by Jerry Bock, lyrics by Sheldon Harnick, and libretto by Joseph Stein. Zero Mostel played the protagonist, Tevye the Milkman, Maria Karnilova his wife Golde, Beatrice Arthur as Yente the Matchmaker, and Bert Convy as Perchik the student revolutionary. Tevye was played by Chaim Topol in later productions; he also starred in the successful 1971 film adaptation by Norman Jewison. 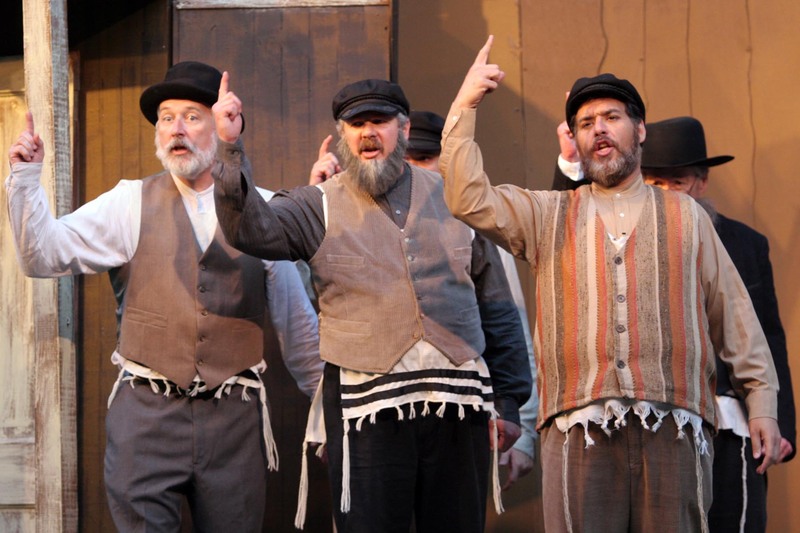 Other actors that have played Tevye on stage have included Alfie Bass, Herschel Bernardi, and Theodore Bikel. The musical was revived on Broadway for the fourth time in 2004, with Alfred Molina (and later Harvey Fierstein) as Tevye and later Rosie O'Donnell as Golde. The revival closed on January 8, 2006. 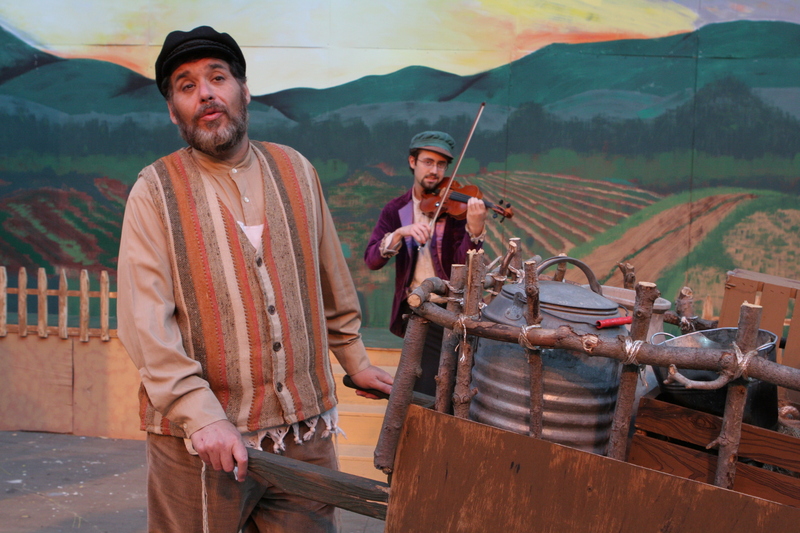 The story is based on Tevye and his Daughters, or Tevye the Milkman by the Russian Jewish author Sholom Aleichem, originally published in 1949. The play is set in the tiny Jewish shtetl (town) of Anatevka in Tsarist Russia in 1905. 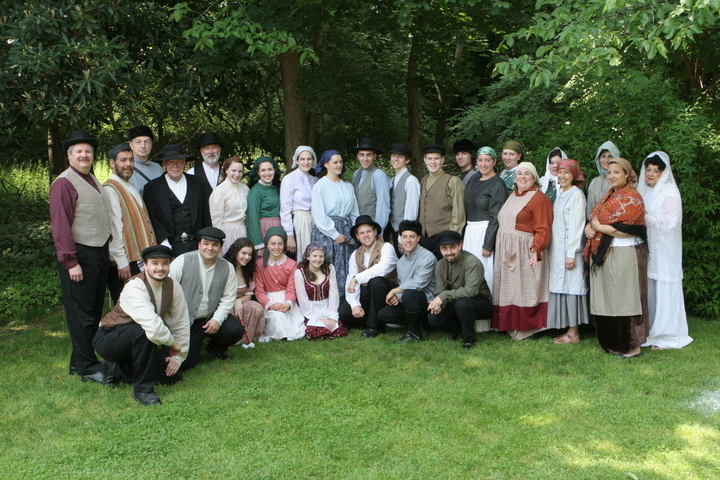 The story centers on Tevye's attempts to maintain his family and religious traditions while adapting to new pressures. These manifest themselves chiefly in the strong-willed actions of Tevye's eldest three daughters, who each select her own husband, contrary to tradition. In both the film and stage production, Tevye has five daughters. The play's name stems from a painting by Marc Chagall, one of many surreal paintings he created of Eastern European Jewish life. The Fiddler is a metaphor of survival through tradition and joyfulness. In the 1971 film adaptation, the violin music was played by Isaac Stern. At Tevye's home, everyone is busy preparing for the Sabbath meal. Golde, the matriarch, is ordering the five daughters about, and Tzeitel, the eldest daughter, spots Yente, the matchmaker, on her way to their house. 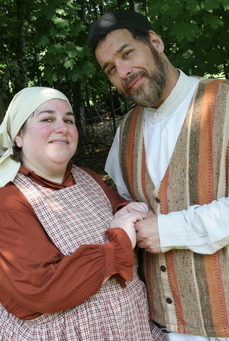 Yente tells Golde that Lazar Wolf, the town's butcher and a wealthy man, older than Tevye, wants to marry Tzeitel, but Tevye must first meet Lazar and arrange the deal. Yente leaves, asking Golde to tell her how it goes. 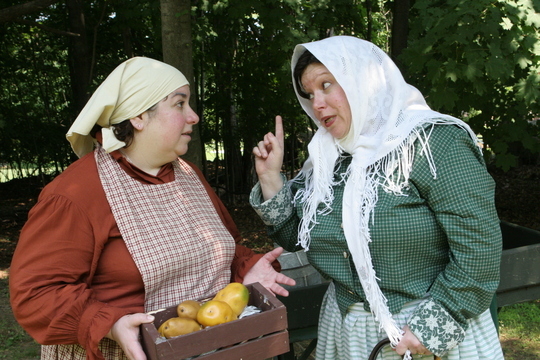 Outside of the inn, a drunken Tevye meets the Russian Constable, who has been assigned to watch over the Jews in the town. He explains to Tevye that there is going to be a "demonstration" in the coming weeks (although supposedly not an actual pogrom). Tevye is saddened by this, but the Constable says he is powerless to stop it, and that he expects that no one will actually be hurt. After the Constable left, Tevye meets the fiddler and dances with him home. At the reception, there is much dancing and celebration. (The Bottle Dance) Lazar causes a scene, angry that it should have been his wedding. Perchik finally ends the fighting by breaking yet another tradition: he crosses the barrier between the women and the men and dances with a girl, Hodel. To save face, Tevye grabs Golde to dance with him and Motel grabs Tzeitel. Soon, everyone, including the Rabbi, is dancing. The dance is abruptly stopped by the Constable who says that tonight is the night for the demonstration. He apologizes but sends in soldiers who destroy almost everything at the wedding and wound Perchik, who attempts to fight back. After they leave, Tevye wearily tells everyone to clean up. As Act II opens, Tevye prays to God about the last act. He calls it "quite the dowry." He asks if God has the time, to give Motel his new sewing machine to help business go faster. Tevye explains these events to Golde who is not happy with the news either. He says they are powerless to stop it though, this breaking of tradition. This love, he says, it's a new style. Tevye then wonders if Golde loves him. Golde is at first hesitant to answer as she thinks it is irrelevant at this time with all of her daughters getting married off without her consent and because it's kind of pointless after 25 years of marriage anyway. Tevye explains that even though theirs was an arranged marriage, his parents said they would soon learn to love each other anyway. (Do You Love Me?) At the end of the song, they realize their love for each other. And so the Jews of Anatevka leave. Lazar Wolf is going to Chicago to live with his brother-in-law. Tzeitel and Motel are going to Warsaw until they can come to America to live with Tevye and his family, who are all going to live with Uncle Avram in New York. Hodel is still in Siberia with Perchik. Yente is going to the Promised Land (Israel, then part of the Ottoman Empire) to matchmake there. Chava returns with Fyedka to try and get Tevye to relent. Though he does not speak directly to her, he tells Tzeitel, as Chava is leaving, that he hopes God will be with them. Everyone says their good-byes and the Fiddler is invited along with Tevye (the original theatrical ending and the movie's ending) or is left behind in Anatevka (the new revival's ending).